Diamond necklaces are undoubtedly very pleasing to the eye, and one of the most elegantly refined commodities that almost every woman wishes to have in their possession. Whether you are looking to wear them on special occasions, resell them, or use them for other purposes, you’d still want to make sure they are authentic. Many women might not be aware of this fact, but diamond necklaces provide one of the largest markets for counterfeiters all over the world. Take the necklace and trying fogging them like you would a mirror, by putting it close to your mouth and letting out the heat from your breath. If your necklace stays fogged for a couple of seconds then it’s probably a fake one. Genuine diamonds should disperse the heat from your breath immediately, without leaving a fog. 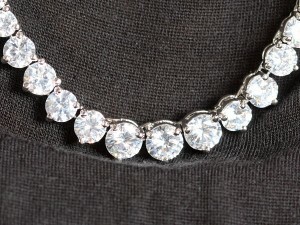 Every genuine diamond necklace is supposed to have a stamp inside the settings indicating the type of metal it was mounted with (10K 14K, 18K 585, 750, 900, 950). Get a jewelers loupe from a jewelry store and inspect your diamond necklace. According to research, mined diamonds usually have small natural occurring imperfections knows as ‘’inclusions,’’ that can be seen with a loupe. When you see small flecks of minerals and very slight color changes, then, it’s a sign that your diamond necklace is a real, authentic diamond. If you don’t see any of these signs, then it’s a fake. Take a bowl of water and dip your necklace in it. Real diamonds should sink due to their high density. If you find your diamond necklace floating on the water, then it’s most certainly a cheap imitation. Take a lighter and heat any of the little stones mounted on your diamond necklace for about 30 seconds, then drop them into a glass of cold water. Wait for a reaction and see if it shatters. This happens due to rapid expansion and contractions that usually overwhelm the tensile strength of weaker materials like glass or quart, compared to real diamonds that are strong enough to stay intact. Genuine diamond necklaces usually come with certificates containing lots of information about the diamond. Make sure yours contains information like carats, weight, measurement, clarity grade, cut grade and color grade. If a seller tries to convince you otherwise, it’s probably because it’s not the real thing. Next time you go shopping for a diamond necklace, be sure to keep these tips in mind to ensure that you get your money's worth, and avoid purchasing a worthless fake.